IPL Controversy is becoming huge day-by-day and also many things are coming out. Income tax officials searched the offices of the two groups associated with telecasting IPL matches. The bidding papers of the Adani and the Videocon groups, which had bid unsuccessfully at the auction, were missing and the Income Tax department was hunting for them to close gaps in its investigations. Those companies are World Sports Group, IMG and Sony Multi Screen Media. The TV rights for India were then allotted by WSG to MSM. However, in 2009, the IPL cancelled the MSM contract, citing, among other reasons, poor-quality broadcasts. MSM went to court, but after a tough legal battle, decided on an out-of-court settlement. The new deal saw MSM paying more than a billion dollars to hold onto the TV rights for the remaining nine years. There were allegations that MSM had also given WSG an 80 million dollar facilitation fee as part of its agreement. The income tax visits officials will not describe them as ‘Raids’ are a part of the government’s promised attempt to clean up what many describe as one of the most corrupt acts in India. Modi says he will not resign and will fight back at a governing council meeting on the 26th of this month. On Tuesday, Pawar met Finance Minister Pranab Mukherjee and Home Minister P Chidambaram; he then met with Shashank Manohar, President of the Board of Control for Cricket in India (BCCI). 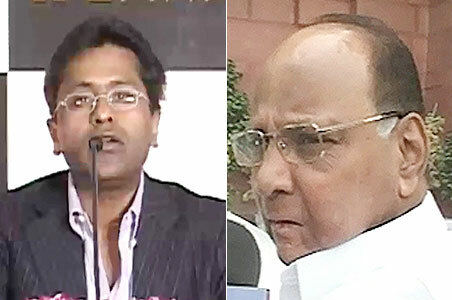 After both meetings, Pawar apparently decided that Modi should be removed from the top post. A newspaper article revealed that NCP minister Praful Patel’s relatives are stakeholders in an IPL team. Another alleges that Pawar’s son-in-law was part of a group of investors who tried to win one of the two new franchises sold last month. Sharad Pawar’s daughter, Supriya Sule, said emphatically that neither her husband nor anyone else in her family has any link to the IPL. “I do not owe anyone any explanation. My family has nothing to do financially with the IPL,” she said. Shiv Sena chief Bal Thackeray today demanded a ban on the controversial Indian Premier League (IPL) “to save cricket”. Politicians are making issue and messing up the IPL by asking Government to ban the IPLis right? Sports no longer left out from politics? Next Rally For Poor Or For Election Publicity By BJP?